Many areas of our Nation are buried under many feet of snow with more to come! Send a card that will warm the hearts of all who see it. This new Sheltering Tree is one of my very favorite new stamps! Send cards all season long - celebrating the beauty of life around us and those in it! From a Valentine to a Just-Because hand-crafted card you can bless others in a big way with a small measure of thought and love. This new Occasions Mini Catalog is PACKED with Great items! 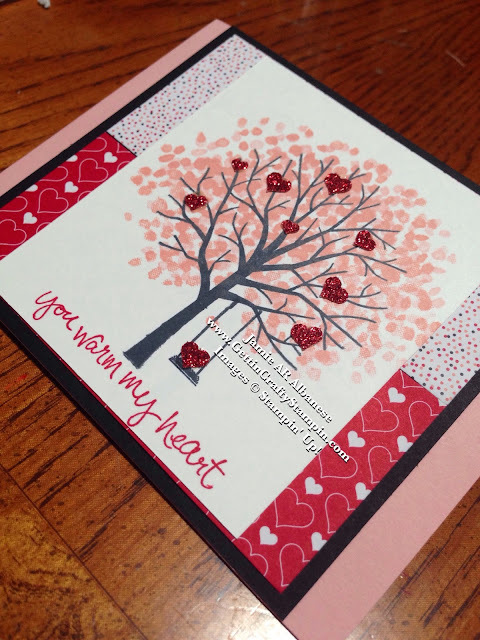 This card, from our recent Valentine Crafternoon, was a HIT and such fun to create! It is a Photopolymer stamp set and the Tuxedo Black Memento Pad works great for that type of stamp set. Framed with the Stacked with Love Designer Series Paper Stack makes for a cute Valentine that works all year long! 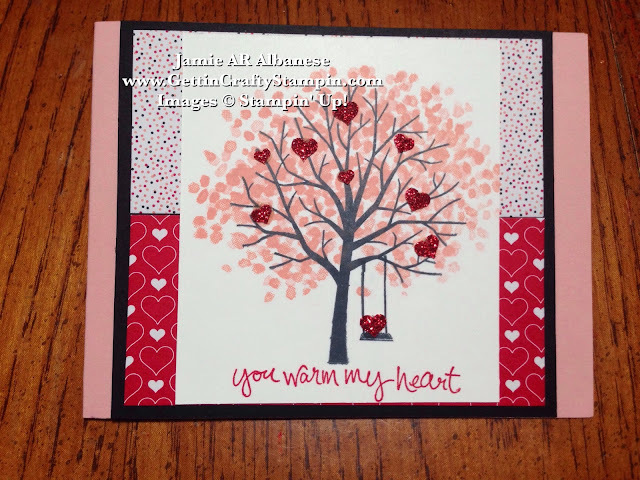 The Blushing Bride ink pad makes for a perfect Cherry Blossom look to this lovely tree. Accented with the Red Glimmer Paper (punched with the Confetti Hearts Boarder Punch, glued on with the Multipurpose Liquid Adhesive - the small tip makes for easy gluing). Send some love this cold winter and warm some hearts! A hand-stamped card goes to live on and bless others - a small measure that delivers massive love. JOIN US in blessing others with some love in the mail! This is a fun Valentine or Just-Because card that will show how others bless you. Does someone add Sparkle and Warmth to your life - take time to show that you care with a hand-crafted card.